In our new weekly series we delve into the newest fitness trends, classes and technologies and explore the latest wellness movements to help you get ship shape for your next superyacht vacation. This week Zoe Dickens tries out personal training with the Wellness Collective at the Sunborn London yacht hotel. The basics: Longing for a bit of sun deck yoga or a quick session in your superyacht gym but can’t get out of London? Mobile fitness firm the Wellness Collective are offering the next best thing with pop-up personal training sessions at the Sunborn London yacht hotel. What’s it like: If you’re used to training al fresco on your superyacht then this is the perfect substitute when you can’t escape to the French Riviera. 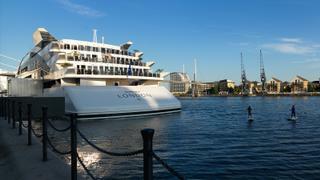 Located in Victoria Docks, the hotel really does offer a fantastic view with the O2 arena and Canary Wharf nearby and, being a popular spot for open water triathlons, the sight of 30 exercise enthusiasts battling it out in the freezing waters of the Thames is enough to motivate anyone. And, believe me, motivation is necessary as the Wellness Collective’s personal trainers do not take things easy. My session involved a mix of bodyweight training, cardio and HIIT-style circuits finished off with a round of Tabata and a few planks for good measure. None of the exercises were particularly revolutionary – if you’ve done press ups, sit ups and squats before you won’t need much teaching – but the small class size did allow for an emphasis on correct form and the intensity and volume of each exercise left me utterly exhausted at the end of the 45 minutes. Running on weekend mornings, the session ended with healthy smoothies and snacks in the hotel’s Sky Lounge which had the dual benefit of curbing bacon cravings and leaving me feeling virtuous for the weekend ahead. Verdict: I’d take this over a standard gym session any day. The personal trainer had me working far harder than I ever could have motivated myself to (I was still aching three days later) and being able to workout on the water just 30 minutes from home was an utter pleasure. The Wellness Collective personal training sessions are available on Saturday and Sunday mornings at £22 per session. Visit sunbornhotels.com/london for more information.